Excessive menstrual bleeding can be treated with hormone therapy, surgery or a combination of both options. Surgery can be used to remove uterine growths or for a more definitive treatment, to remove the uterus itself. Surgical procedures include endometrial ablation, myomectomy and hysterectomy. Endometrial ablation is a medical procedure that uses energy to destroy the endometrial lining of a woman’s uterus. This technique is most often employed for women who suffer from excessive or prolonged bleeding during their menstrual cycle and is most commonly done on an outpatient basis. Endometrial ablation is contraindicated in patients who may want to get pregnant. 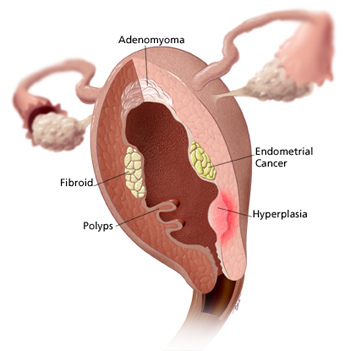 Myomectomy is the surgical removal of the uterine fibroid growths. These can be removed successfully with a robotic laparoscopic procedure or hysteroscopicly if the fibroid extends into the uterine cavity.